The Rubbermaid Commercial HYGEN Clean Water System is a simple step toward sustainability. It conserves water and limits the amount of detergents emptied back into the environment. It consists of a heavy-duty mop bucket that can filter and reuse the same container of water again and again. When the mop water gets dirty, simply tilt the bucket 90 degrees. The dirty water transfers to a filtering chamber. Tilt the bucket upright again, and in a few minutes, clean filtered water passes back into the mop chamber. Both water and detergent are conserved. 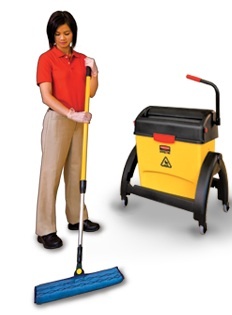 The Rubbermaid double-sided micro mop heads clean floors faster and more effectively than a string mop. They are proven to remove 99.9% of microorganisms and remain durable through 1000 launderings. The HYGEN double roller wringer is adjustable to control the dampness of the mop, and it has special scrubbers inside to remove more dirt from the mop head. The HYGEN system has been well tested since its first introduction a few years ago. Rubbermaid Commercial did a complete study at Butler University in Indianapolis. The system saved Butler 50% in time and productivity, 6000 gallons of water, and $6000 in labor costs over a 1-year period. The Rubbermaid HYGEN clean water system is a simple step toward sustainability that any operator can implement immediately. Rubbermaid offers ongoing training and support programs and has a “Return On Investment Calculator” for measuring performance.